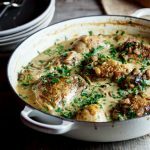 Succulent Dijon chicken thighs cooked in a creamy leek sauce. This fuss-free, quick and easy recipe is perfect served with steamed rice and greens. 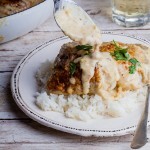 The love for creamy chicken recipes is strong my friends. But can you blame me? 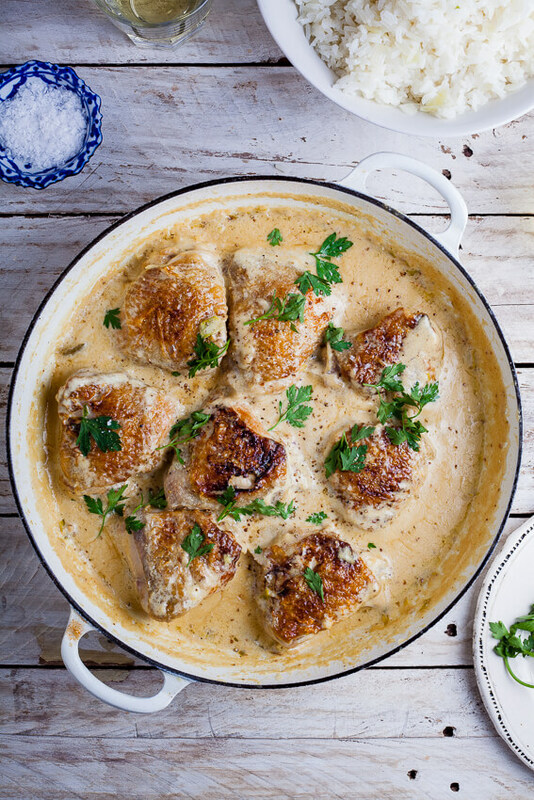 Who wouldn’t love succulent, juicy chicken cooked in a savoury cream sauce? And then you add soft, silky leeks, a punch of Dijon mustard and a good squeeze of lemon and you know what you have? 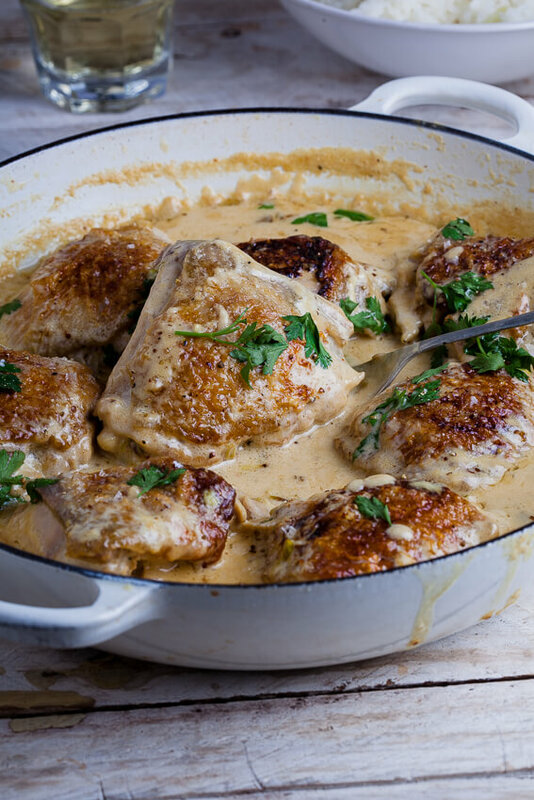 Creamy Dijon chicken perfection. I’ve been making this recipe for absolute ages. Kind of one of those recipes you don’t even follow anymore, you just throw everything into a pot and know what the outcome will be. It’s instinct at this point. But it’s always a winner. As is the case with Nigel Slater’s Coq au Riesling, this can be served with rice, mashed potatoes, crusty bread and even polenta but I chose rice here because I have fallen back in love with Jasmine rice and will serve it with everything I possibly can. A side of steamed green veg or salad will round this out perfectly and will result in a seriously good, really simple weeknight meal. 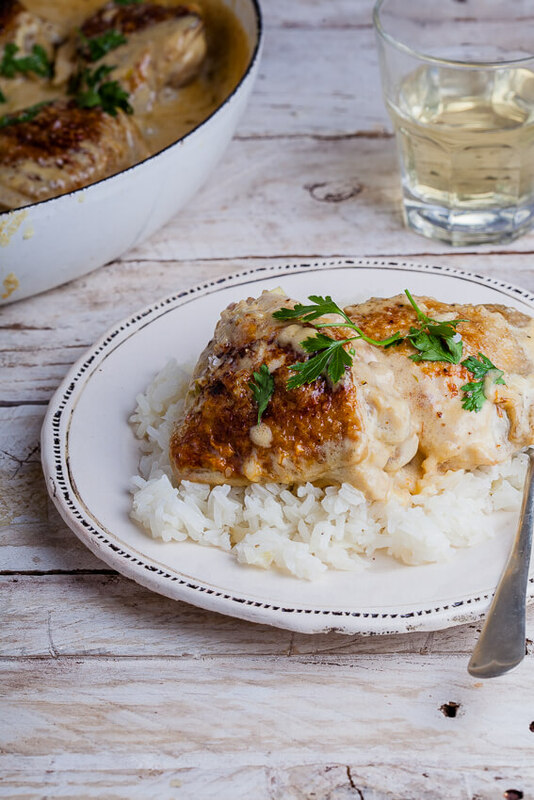 How do you make Dijon chicken? Brown chicken thighs in a large pot/deep pan then remove and fry leeks and garlic until soft and aromatic. Mix cream, chicken stock and Dijon mustard and pour in. Add the browned chicken thighs then allow to simmer until the sauce has reduced and thickened and the chicken is fully cooked. Dijon mustard is a French mustard named after the town of Dijon in Burgundy, France. 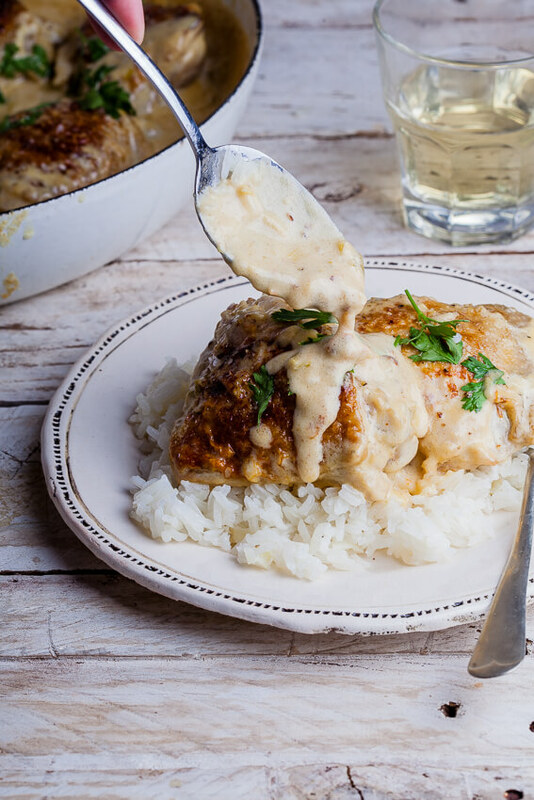 It’s a rich and creamy with a strong mustard flavor. It’s perfect used in creamy sauces and dressing. Can I use regular mustard instead of Dijon? Yes, you can use any mustard to replace the Dijon mustard in this recipe but it won’t have quite the same flavor. Can I bake this recipe in the oven instead of cooking on the stove? Yes, you can. Follow the recipe all the way up to adding the chicken back into the sauce and then place the pan in an oven, pre-heated to 180ºC/350ºF, and bake for 20-25 minutes until the chicken is cooked through. 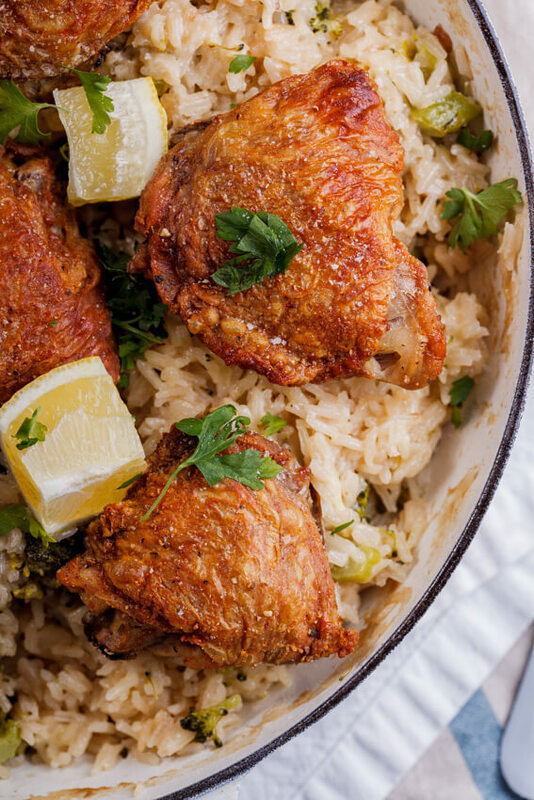 What can I make for dinner with chicken thighs? Heat 2 tablespoons of oil in a large, hot frying pan and brown the chicken on both sides. Remove from the pan and set aside. Add the chopped leeks and garlic to the pan and fry for 30 seconds - 1 minute until soft and fragrant. Mix together the cream, chicken stock and mustard. Pour into the pan. Allow to simmer for 2 minutes then add the browned chicken thighs back into the pan. Turn down the heat and allow to simmer for 20-25 minutes, covered, until the chicken is cooked through. If needed, add more stock to the pan. When the chicken is cooked, season with lemon juice, salt and pepper. Sprinkle over the chopped parsley then serve with rice and steamed greens. I often adjust the ratio of liquids to create more sauce, especially when serving this dish with rice. I use 2 cups cream to 1½ cups stock and will often add more stock during the cooking time. Thanks Nicole. It’s a winner for dinner! 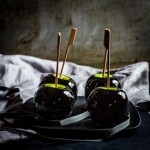 This looks sooooo incredibly delish Alida! That sauce. Perfect over the rice! And you can’t beat the juiciness of those chicken thighs! Thanks Mary Ann. Chicken thighs are my fav! Can I substitute the leeks with something else? Definitely! You can use red onions, shallots or regular onion. Just chop it finely and cook a little longer to develop the sweetness in the onion. Has anyone putting this all in the slow cooker? I wonder if the end result is the same! I haven’t yet but I think it will work very well in the slow cooker. You might just need to thicken the sauce a little with a mixture of cornstarch and water. I made this last night. My four leeks didn’t cook down and blend in with the sauce; my sauce looks nothing like yours. I used only the white and light green parts of the leeks. My sauce is chock full of leek pieces. The flavor is good, though, and my chicken thighs were tender. My leftovers are in the fridge, covered in the bountiful sauce. It could be that your leeks were very large (I’ve amended the recipe). It’s also important to slice them nice and thin and then to give them enough time to soften properly before adding the rest of the sauce ingredients. If the leeks bother you, you could also run the sauce through a blender to smooth it out. It looks amazing. But can I change the mustard for something else? (we do not like the taste of mustard) Thank! You could simply omit it, but I would then up the amount of salt and lemon juice added to add more flavour. Can this be prepared a day or two (or 3) in advance? If so, how long and what would be the reheating instructions? I’m having house guests for several days and am trying to have meals that are all cooked in advance! I would make it the day before then allow to cool completely before covering and placing in the fridge. Simply re-heat on the stove. I made this for dinner last night and it was DELICIOUS! The lemon put it over the top. At some point the sauce got too hot though and broke, but I just removed the chicken once it was done and pureed the sauce with an immersion blender. It worked perfectly and was wonderfully creamy and rich. I also threw the chicken under a broiler while I was working on sauce to re-crisp the skin a little bit, which my husband loved. Also, it took me longer than the 25 minutes to cook the chicken through. They took about 35 minutes to cook to nice and tender (and I would the thighs were on the smaller side, too). I’m so glad you liked this dish Alyssa. And that’s a great tip for saving a broken sauce. It had a nice mild flavor. The only issue I had was that the sauce was soooooo runny. I kept covered as instructed but maybe if I hadn’t it would have thickened? I seriously feel like I need to make a leek soup with all the runny leftover sauce. You could add a little cornflour mixed with water to thicken the sauce. It could be that your chicken released a lot of liquid while it was cooking. Skin or no skin on the chicken? It really depends on you, either is fine. 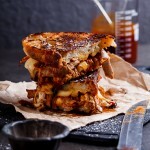 Amazing recipe !! I used a little less garlic and a little extra Dijon. I made broad egg noodles on the side. 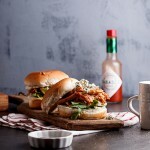 This will absolutely be a new staple in my dinner rotation! As good as the recipe sounded when I first saw it, the chicken was bland and not delicious at all. It was a big disappointment. I’m so sorry to hear that Lucy. Was it that it was underseasoned or that it just lacked flavour? It would be quite strange if it lacked flavour because all the ingredients are quite flavourful. I’d love to figure out what it was that went wrong here. Hi. Can you give an amount of leeks that is more specific? Cups when chopped? Leeks vary in size. It amounts to around 1-1½ cups. This was an amazing recipe! One thing I wanted to try was to add some wine in to deglaze the pan. What do you think, 1/2 cup white wine, 1/2 cup chicken stock? Or just add in a 1/2 cup wine and keep the 1 cup of chicken stock? I’m so glad you liked it Emily. Wine would be great with this. I would do 1/2 cup wine and 1/2 cup stock and then see if you want it saucier then maybe add the remaining stock? Just make sure to reduce the wine properly otherwise it could make the sauce very acidic. Looks great! Will make it right now! Delicious!! So glad you liked it Olivia! This one will be a winner! Ah, I’m so glad you liked it Olivia! As good as the ingredients sounded together I followed the recipe to the letter (using legs instead of thighs) and homemade chicken broth and the result was bland. bummer. Hi Marianne. I’m so sorry you found this recipe disappointing. Was it just bland in general? I was actually worried that amount of garlic, mustard and lemon might be too strong for some people. 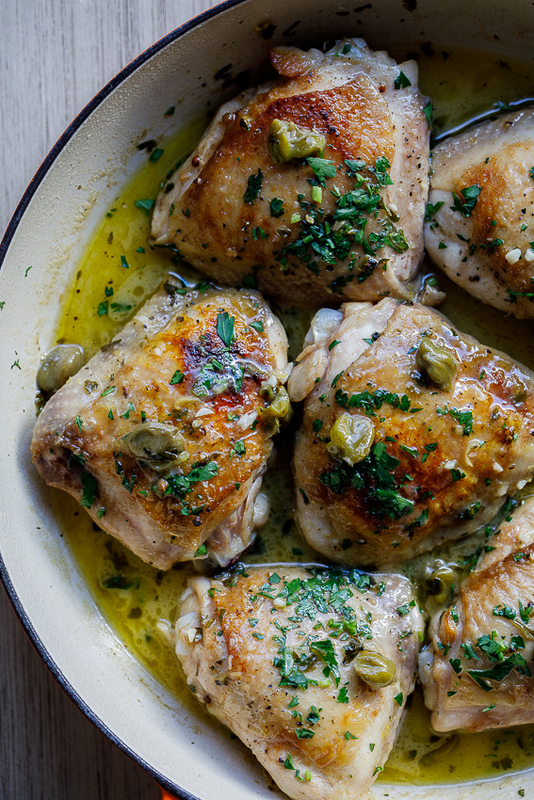 Could you substitute chicken breasts for thighs? You could, just make sure you don’t over cook them though. Thighs can take much more cooking than breasts. This looks yummy! If I wanted to lower the fat content by using fat-free half-and-half in place of the cream, should I add a little cornstarch slurry? Yep, a little cornstarch will help thicken it up and will stabilize the milk so it doesn’t split while cooking. 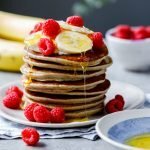 Do you think this would be delicious with coconut cream instead? I think it would be! I’m just not sure if the coconut cream will thicken the same way dairy cream does. If you don’t mind that, great! If you want it a little thicker, just add cornstarch mixed with a little water and allow it to cook through. Looks great, can I sub coconut milk? Wife is dairy free. Thanks! Yeah, should be no problem. If the sauce doesn’t thicken to your preference, perhaps just add a little cornstarch mixed with water and allow to cook through. I don’t have cream but I do have mascarpone – any idea how much of it I should use here? 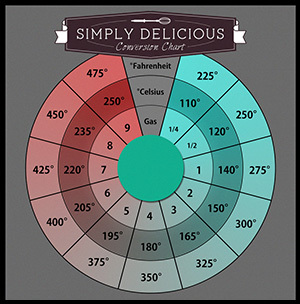 I would add a few tablespoons at a time and test to see if you are happy with the creaminess. Just be sure not to boil/simmer it as the mascarpone could split. This looks amazing! Did you use boneless or bone-in thighs? Thanks! Can’t wait to try. Thanks! I used bone-in. The flavour is unreal when you use bone-in chicken. Looks delicious and it is making me hungry. Seriously need to make. Thanks for sharing. Let me know what you think once you’ve tried it Lisa! This chicken looks absolutely delicious! Love that creamy sauce!